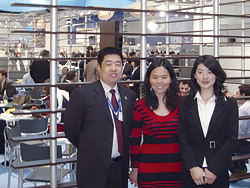 Interpack 2008: a record attendance beyond all expectations! 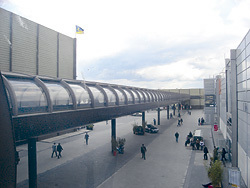 The 50th edition of Interpack, the international exhibition held in Düsseldorf from 24 to 30 April scored a record attendance of 179,000 visitors. 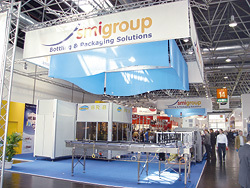 Hundreds of people also visited the SMIGroup booth, where we exhibited our latest innovations: the new 8-cavity model (SR 8) of stretch-blow molder (14,000 bottles per hour) and the shrinkwrapper SK 600, equipped with the new stacker "TS" (60 packs per minute). The SR 8 features the new preforms heating module (oven), with the preform mandrels pitch reduced to 40mm. This innovation increases the machine output by 20%, though the energy consumption is always the same. Moreover, the electrical panel is totally integrated in the blow-molder frame, thus eliminating the need of connection cables between the machine and the electrical panel and reducing the machine overall dimensions. The SMI SK 600 shrinkwrapper, equipped with the new "TS" device for superposing the trays on two or more layers, also drew plenty of attention. Thanks to the operating flexibility, the user-friendly technology and the market-oriented solutions, the SK series can meet the requirements of the most demanding customers. Ideal for the packaging of beverages, food and non-food products, our SK series shrinkwrappers can offer several types of pack collations and pack sizes: only film, pad+film and tray+film, on one or more layers. Furthermore, the possibility to use printed film ensures additional advantages, from a marketing and promotional point of view. The new machines exhibited by SMIGroup aroused great enthusiasm among the visitors coming from all over the world; in particular, the businessmen coming from Asian nations formed a large contingent and confirmed their interest in our high-tech products. Visitors from South and Central America similarly made their presence strongly felt. By the way, America is the continent where the next exhibitions attended by SMIGroup will be held: Fispal, in São Paulo do Brazil, from 3 to 6 June and Expo Pack in Mexico City from 24 to 27 June. As far as Asia is concerned, SMIGroup will participate at Propack Asia, in Bangkok, from 11 to 14 June and at China Brew & Beverage, in Beijing, from 24 to 27 September.